For years, I have heard people say how much they disliked history growing up. “It was my least favorite subject in school.” This is a very popular opinion. When learning is a series of memorizing dates and names then I agree, it is boring. History is losing its hold in the mainstream classroom. It will be cut out in years to come. There is a way to create a love of this subject for your children. Maybe, you’ll learn to love it again too. Throughout the world, history is inches from modern life. It is everywhere. Most of the planet courses and pulses through immense amounts of ancient history that a lot of people do not know is there. For example, throughout Greece and Italy, every time a new subway line is dug another archaeology site is uncovered. This is not typically an issue in the United States due to its incredibly young history in terms of the wrinkle of time, but the history is still there. No matter what your topic of interest, there is something to see and explore in close proximity to you. If the Civil War is your American History preference then the East Coast is covered in fascinating, patriotism inspiring locations to explore that are FREE. From reenactments to open battlefields and everything in between. The possibilities are endless for your children to learn. The subject matter that these places evoke is vast. From slavery and Civil Rights to architecture and medical treatment. You and your family can, in theory, learn everything you’ve ever wanted to know in regards to life and war during the 17th century; all sparked by a few stops in the Eastern United States. The Midwest has its own claims to fame in regards to the Civil War, but what you will find the most of is beautifully preserved Native American history. California is full of Missions, Gold Rush, Wild West, and the list goes on and on. Every single U.S. states offer something wonderful if you’re willing to seek it out. This is probably the question that I get asked the most; along with “how do you find these place?” The process is rather simple. Google. I kid you not, we live in a day in age where I can google “Historical Landmarks along route 66” and I will get a plethora of results. Not every stop is mind-blowing, but with enough early research, they can be. For example, when we were PCS-ing from Camp Pendleton to New River, NC I searched for “things to do off of route 66 (insert state).” That led us to Meteor Crater, which was amazing! It also gave us endless amounts of things to do in the states that I thought would be “long and boring” to drive through. In that particular 47 hour trip, I remember being leery about driving through Western Texas and New Mexico. Hot long hours in the car, but with some research, we were able to make stops like Cadillac Graveyard in Western Texas, which sparked great conversations about art as a creative movement and art history. There are many times while traveling that I have visited destinations ONLY to see a piece of history that I cannot see anywhere else. Even people who don’t particularly care about history do this. Rome, for example, is a destination entirely based on seeing history. Nobody visits Rome for the cultural exchange. It is too touristy for that. People go to Rome to see the buildings and places where world-changing history took place. The above photo is a small portion of a building complex on the Eastern coast of the island of Crete in Greece. I had no other reason to visit that area. EVERYTHING else I wanted to see was hours away on the Western side. I had waited my whole adult life to stand on the grounds of this particular building. My kids were unimpressed and that was fine with me. There were pieces of it that they loved like the peacocks walking around freely, which led to a long conversation about peacocks and symbolism for royalty. History brought to life, literally, in a bird. This conversation turned the entire outing around for my kids. Suddenly, other aspects of the complex began making more sense. Deciding to make time for living history adventures is the hardest part. Switching from an “I’m too tired to care about that” lifestyle to a “Let’s go see what it’s all about” lifestyle is difficult. It will not always be exciting. It will not always provoke insightful conversations. Not everything you try to achieve presents as a win when first executed. Teaching your children to love history through going out and seeing it, being a living part of the history of that place, will, however, teach them a deep appreciation for history. Appreciation is where it all begins. Get out there. World War II history enthusiasts the world over gravitate towards Germany to see where the history began. Though World War II history is dispersed all over Europe, Germany is the perfect place to start experiencing it. Here are our top Three things to see for your World War II history buffs. 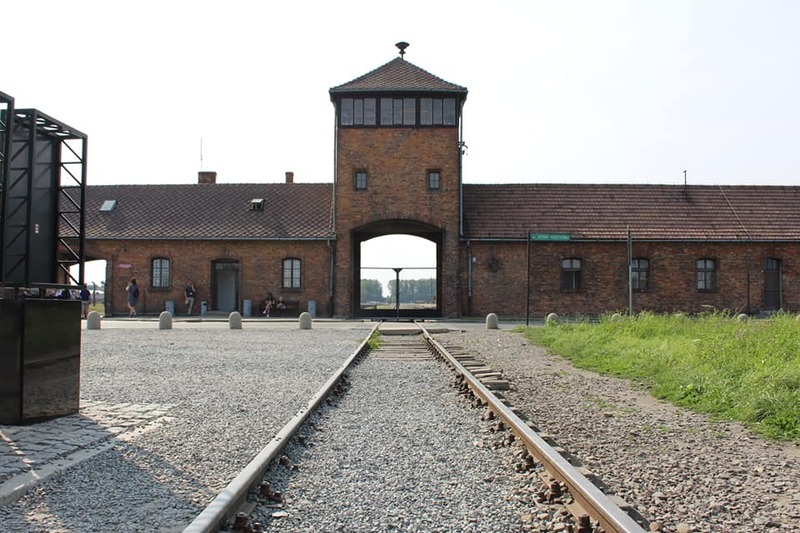 The first concentration camp made by the Germans, which would be the model for all death camps to follow. Dachau, of course, is a very haunting place, but it is also full of vital Nazi support information that will help you to better understand all future strategical moves. While visiting Dachau you will see the blueprints for the concentration camps. As-well-as, the desk that holds all of the inmates’ identification cards. 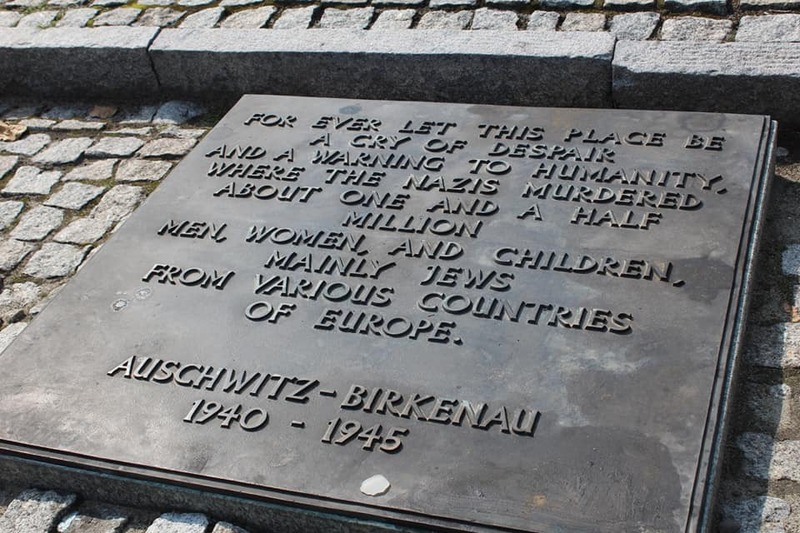 You learn so much about what the first 24 hours in a concentration camp might have been like. Dachau is now home to some very moving pieces of communist Germany artwork. These pieces were primarily dedicated in the late 1970s and early 1980s in memorial to the lives lost at the Nazi hands. 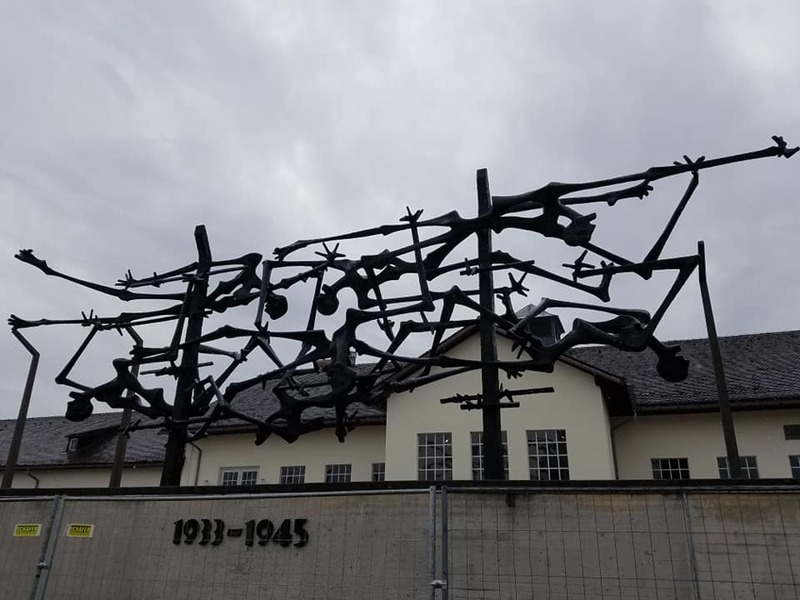 The grounds of Dachau have been left in as original a state as possible and you are able to wander in and out of most of the buildings, which are also handicapped accessible. The grounds are barren and grey but full of history and stories longing to be told. 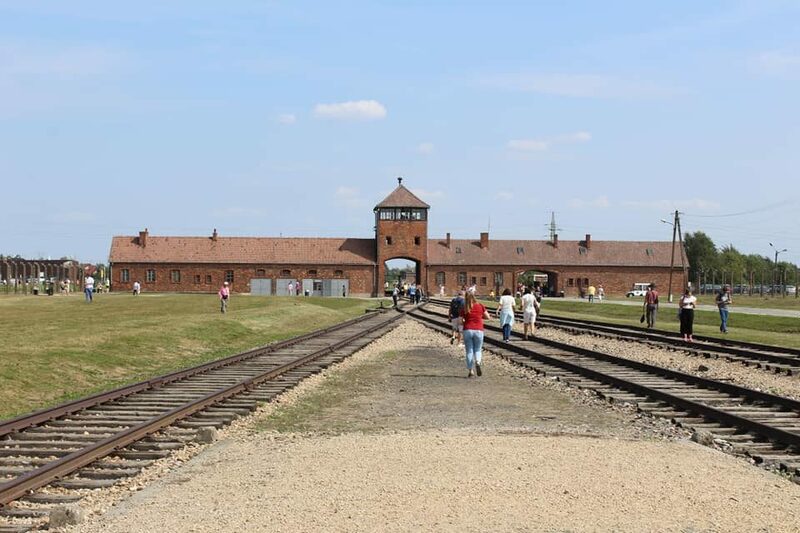 When deciding to visit Dachau you should plan on spending a long afternoon or morning there. You could easily spend a full day, but half a day is all that is really necessary. Make sure to dedicate some time to the photo catalogs that were confiscated after the war and to reading about the prisoners whom historians have uncovered their beautiful pre-Holocaust lives. An absolute must do in Germany, whether you’re a World War II history buff or not is Hitler’s Eagle Nest. Part birthday gift and part fortified hideout this place is amazing. You need at least a day to fully appreciate the magnitude of the site and another day to wander through the amazing village. Getting to the top of the Eagle’s Nest is quite the ordeal. You must purchase bus tickets from the visitor’s parking lot and then you are shuttled the 8 miles to the top, but you learn a lot about the land along the way. 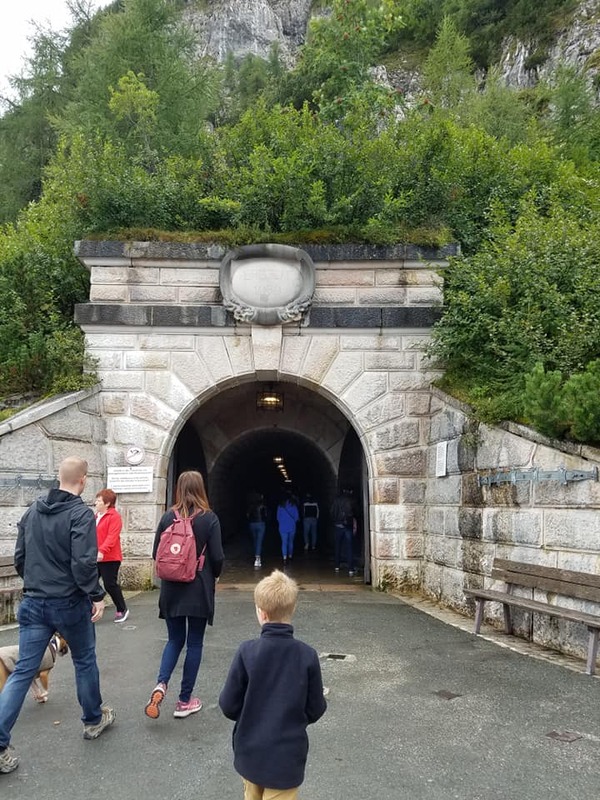 Once you have reached Hitler’s private entrance you walk through a passageway cut through the mountain where you find Hitler’s private elevator. The history of the people that have walked through that space is very chilling. The conversations had in the elevator can only be imagined, but I am sure they were quite extraordinary. Once you have reached the top of Hitler’s Eagle Nest you have the option to eat as the original building has been turned into a restaurant. The most impressive thing is the scenery itself. The view is spectacular, the isolation is inspiring and the available hiking should be done time and time again. At the end of our trip, we wished we had had more time to hike there. A full day wasn’t quite enough. This beautiful, historical city has so many things to offer. If time allows a few days here would be best, but for World War II enthusiasts there is one stop, in particular, that must be done. The Nazi Documentation Museum and the Old Nazi Rally Grounds. All of the documents that truly exist, but are hard to imagine are housed here. Disclosing the Nazi secrets to the public and educating visitors in regards to how a tragedy of this magnitude comes to be. 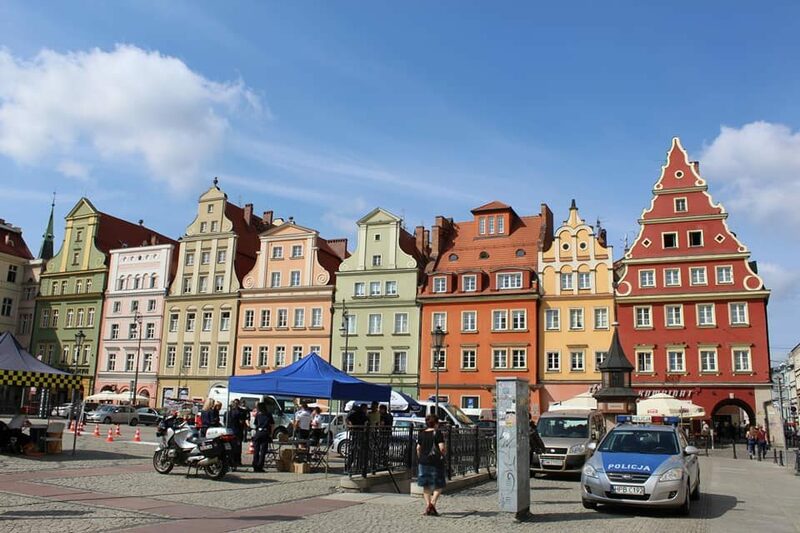 When deciding to travel throughout Germany the very best way is by car. Car rental is very affordable and driving is quite easy. The largest issue with traveling by car is that there are signs for amazing things to see everywhere! Getting to your destination in a timely manner is difficult due to off-highway exploring of other wonderful sites. If World War II is your main focus, I highly recommend starting in Germany as these sites mentioned above will give a very solid foundation for what you will see elsewhere in Europe. 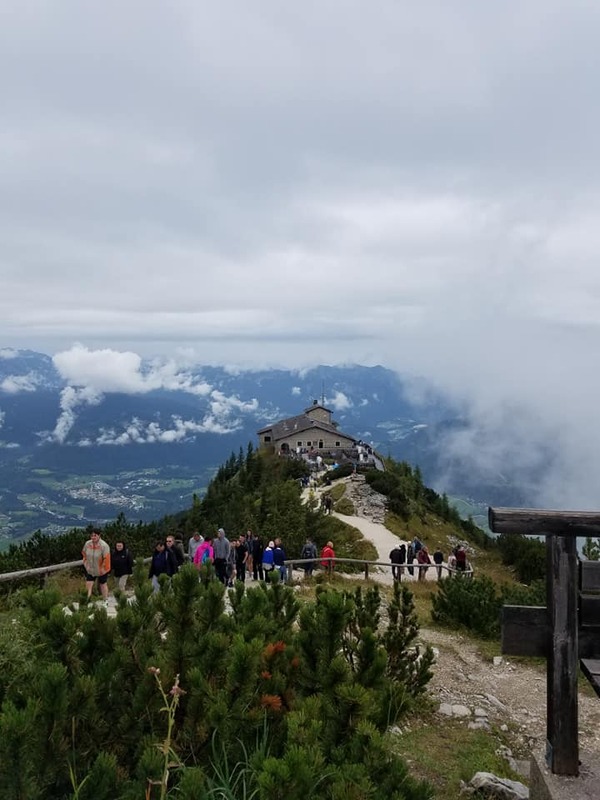 If you make it as far as Hitler’s Eagle Nest then you are only 45 minutes from Salzburg, Austria and many many more World War II sites in Austria and beyond. Get out there, but remember the solemn space that many of these places try to hold and tell the story so history doesn’t repeat itself. Tucked deep in the Austrian Alps is this jaw-dropping beauty of cultural preservation. Halstat, Austria presents as a place that time forgot. Somewhere you can go and wander in aimless joy for hours. It’s 16th-century homes and alleyways are home to shops and cafes. Visitors can entertain themselves for days no matter what your sightseeing aspirations might be. Hallstatt offers something for everyone in your travel party. There are endless amounts of snow skiing and glacial cave exploring to be had during the winter months. During the summer there is boating on Lake Hallstatt. Of course, there is always eating at the quaint cafes and taking in the breathtaking views at every turn. You can sit and watch the glacial run-off for hours, which courses through the village via little channels. One of the most famous outings in the Hallstatt region is the Echern Valley Glacier Garden and Waterfall. Accessed by trailhead and a beautiful day well spent. Guides are available and full of information. If hiking is not your thing the food in the village is to die for and cultural tours are affordable and given daily. The Salzwelten is fun for the whole family! A mine with many descending levels and a subterranean lake allows a full day of exploration. You get to the lower levels of the salt mine by sliding down slides! What could possibly be more fun than that? Fair warning though, you do have to be FOUR or older to enter the mine, but it is a must do in the area. You reach the entrance to the mine by sky car and gain an immense amount of knowledge about the WORLD’S OLDEST SALT MINE. Getting to this beautiful village is half of the fun! The scenery is stunning and one should stop at every wide shoulder to take a photo of the Alpine backdrop. The easiest way to get there is by car, but the bus does run to Hallstatt and is a short ride from Salzburg. Make sure you make a morning drive out of whichever option you choose because finding accommodations in the dark would be a great challenge. The village is very small and therefore is booked very far in advance. A few Airbnb options exist, as well as hotels ranging from four walls with a mattress to luxurious winter retreats. Deciding how you’d like to spend your money and time will be a challenge that requires planning as there are so many options. A bit of advice though, you will spend very little time in the accommodations you choose. Hallstatt, Austria is a place where you want to spend endless amounts of time, but I highly recommend that that time is spent slowly. Taking in the architecture, the apple strudel, the beautiful pear tree that has claimed one of the homes. There is something incredible at every turn so take your sweet time and breathe it in. No one is in a hurry here. Time is allotted for slow strolls and swan feeding. This is one you really need to get out there to see. I have been very quiet on here the last few weeks, well really it’s been a month. I’ve been majorly slacking over here and there are a few reasons why. Though I do not need to justify my lack of writing to anyone, I want people to know that I love keeping and writing a blog, but I am a busy mom and there are seasons where saying nothing seems to be better. Deployments are a messy thing for families. We have spent the last 8 weeks learning to live with each other again. Greg has been re-acclimating to the volume that is a house with three little boys in it. I am trying to re-motivate myself to be a domestic goddess though that is such a tiny, rather unenjoyable, aspect of my identity. We have added extracurriculars for the big boys. They wanted to do cub scouts and jiu-jitsu so that is consuming our weeks right now. We are desperately trying to make new friends since we are living in a new place that is unfamiliar to us. What’s New with Me? Well, I am really busy growing. Growing as a mother, wife, spiritually (as there are more Baha’i members in this region of N.C.), trying to settle a home that is rather small for all of us, juggling visitors, holidays, and upcoming trips. Mostly, I’ve been writing elsewhere. For the last year, I have been writing for Daily Mom Military Magazine. I have a weekly column that keeps me very busy, but on top of that I have been doing Holiday gift guide reviews for them and that has taken up a large part of my “extra” time since November. I have also been shoveling myself, the children and the dog back and forth to overseas clearance doctor appointments. What’s New with Greg? Greg has started what they call the FRD. Basically, it’s a miniature flight school to switch from one flight platform to a new one. In his case, he has gone from the Huey Helicopter to the C130 Hercules. What that means is he is studying hard and long hours on top of doing an online school program called EWS (Expeditionary Warfare School). He is very busy. Like woa busy. Of course, on the weekends I keep him very busy as well. What’s up with the sudden D.C. trip? Well, a dear friend of mine (also a bridesmaid in our wedding) is having her first child here in the D.C. area. She has asked me to doula and encapsulate for her so the kids and I are renting a one bedroom apartment in the D.C. area for two weeks! So far the weather has been quite kind to us for D.C. in February. I’m hopeful that we will have a new baby to ooo and ahhh over soon (any day). What’s up with the sudden India Trip? A similar situation, a friend asked and I said “yes.” It goes back much farther than that, but an old college dance partner of mine as requested my presence in India. Therefore, the kids and I are going for a quick trip that will hopefully curb my international craving until later this year. I will say that saying yes to friends and being a better friend was my main New Year focus phrase. I am really bad at falling into the “out of sight out of mind” friendship category. I also love my friends tremendously, but I can’t always find the energy or time to call so 2019 has presented me with two opportunities to serve my friends better and I’ve taken them. Financially, I cannot say yes to this extreme any more this year, but I hope that the acts are noticed and the memories made until I am able to serve them again someday. I am trying hard to invest more in the people that are already in my life and spend less time trying to market my friendship capabilities to new prospects. I hope that Winter’s time of rest and hibernation has brought you a clearer mental state, a better understanding of how to reach your goals for 2019 and most importantly, perspective. Can You Travel Europe In a Wheelchair? The short answer is YES! YES, YOU CAN! The involved answer is still yes, with some assistance, perseverance and a plan. All of Europe is older than the concept of accessibility for all, but a lot of advances have been made to accommodate those willing to travel. You will encounter a lot of difficult things, but what you gain from visiting these gems far outweighs the struggles. Although I am fortunate to not have a child dependent upon a wheelchair, our middle son shattered his right foot our first night in Rome. He broke it so severely that he was non-weight bearing on it for 6 weeks. 6 weeks translated to 6 European countries with a wheelchair that I purchased second hand from a pharmaceutical vendor. In some instances, this accident changed my travel plans completely, but on the other hand, it forced me to see the larger world through the eyes of someone with a disability. The good news about traveling in Europe is that your transportation options are incredibly accessible. Riding on trains with wheelchairs is a wonderful experience for reasons that I will share momentarily. Across Europe, you will struggle to roll over curbs and cobblestones, but roll you shall. Visiting monuments, because of their age, will be the largest struggle. 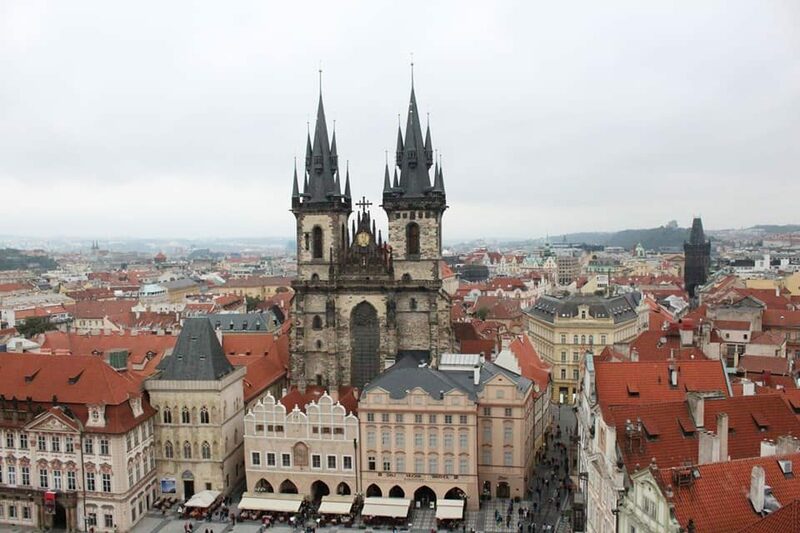 Many European treasures have made their first floors and entrances wheelchair accessible, but making tiny towers and upper levels accessible is difficult and few and far between in European monuments. I know this is not what you wanted to read, because who doesn’t want to go to Italy and Greece? I’m here to tell you that you should and you can! These two countries are just not as easy to navigate in a wheelchair because of the narrowness of sidewalks, roads, entrances. The lack of elevators throughout is an obvious challenge. Also, both of these countries have less funding to make accessibility improvements. 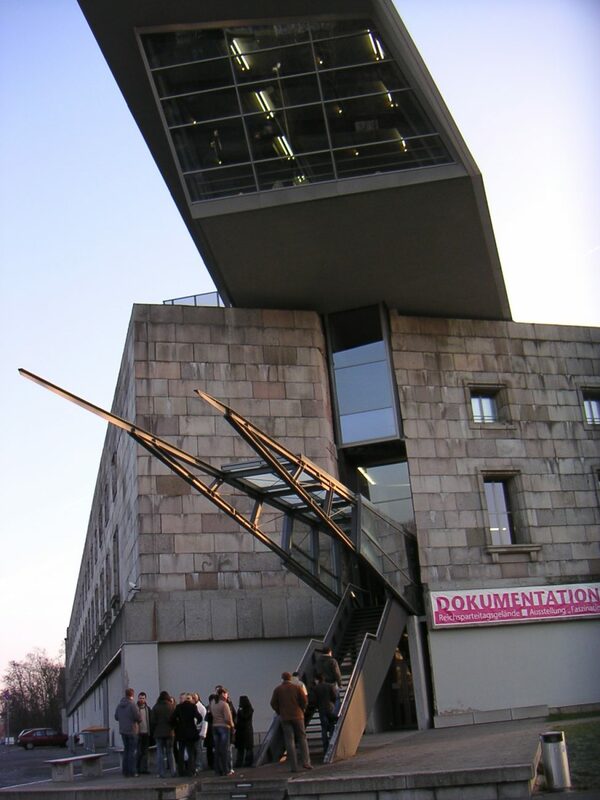 The museums and archaeology sites, however, are very accessible! I was offered assistance, for free, in every single train station throughout Europe. Each country has its own accessibility program within their railway systems. You can book the handicap seat online, which allows for a lot more room to fit the wheelchair in. If you locate the accessibility office within the major city railway hubs then they can schedule assistance at all of your stops to help get you and the wheelchair off the train AND will hold the next train to load you on! A HUGE HELP! If for some reason you cannot book the handicap seat online then they can help you change your general seat to the handicap seat at this office as well. Truly a wonderful resource. These offices are usually very busy places so give yourself ample amounts of time to fully utilize everything they have to offer! A website that was particularly helpful when our plans abruptly changed was http://www.sagetraveling.com. 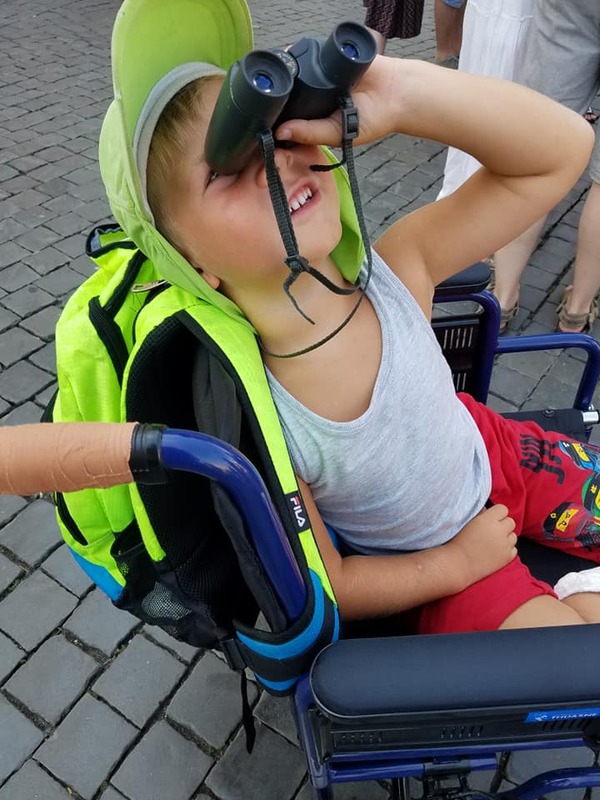 This wonderful sight is a little difficult to navigate, but will help you learn about the accessibility of specific sites, monuments, cities, restaurants, and other local resources and tours that cater to the accessibility audience! 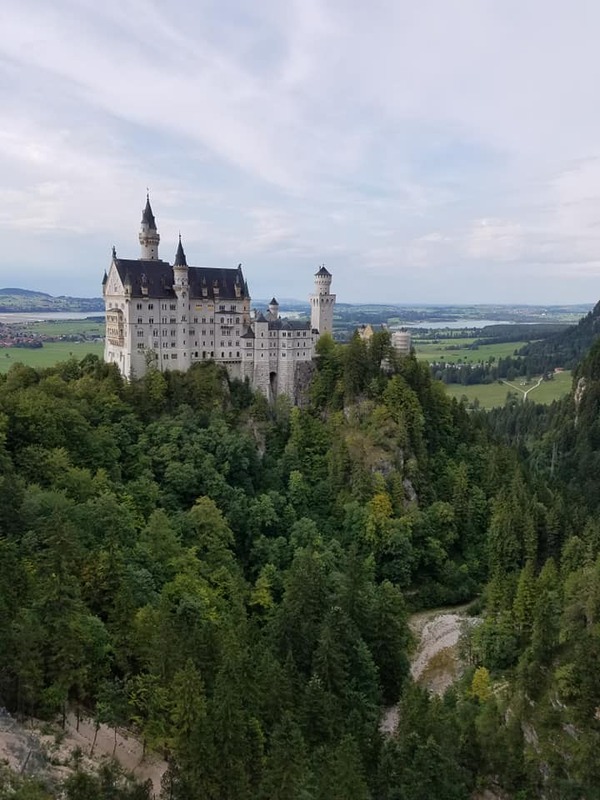 Before you even start planning your trip to Europe you need to spend some time exploring the resources that Sage Traveling has to offer. Travel is not only for the physically sound tourist. There are resources out there and help everywhere to achieve your travel goals. Make a list of places you want to see. Prioritize that list and begin researching how to make it happen. You can do it! From sightseeing alone with a child in a wheelchair like I did to hiring an accessibility savvy tour guide. Anything is possible if you take a chance on the capabilities of yourself and hidden helpers throughout the world. Get out there. We all enter our relationships with “things.” It is inevitable that we will bring something special with us into our homes together. As babies arrive on the scene we want to include them in the “specialness” of these family heirlooms, but like any other child, they couldn’t care less. So how do we teach our child respect for an inanimate object? They don’t have to love it right? But they do have to respect it and give it enough space to protect it. 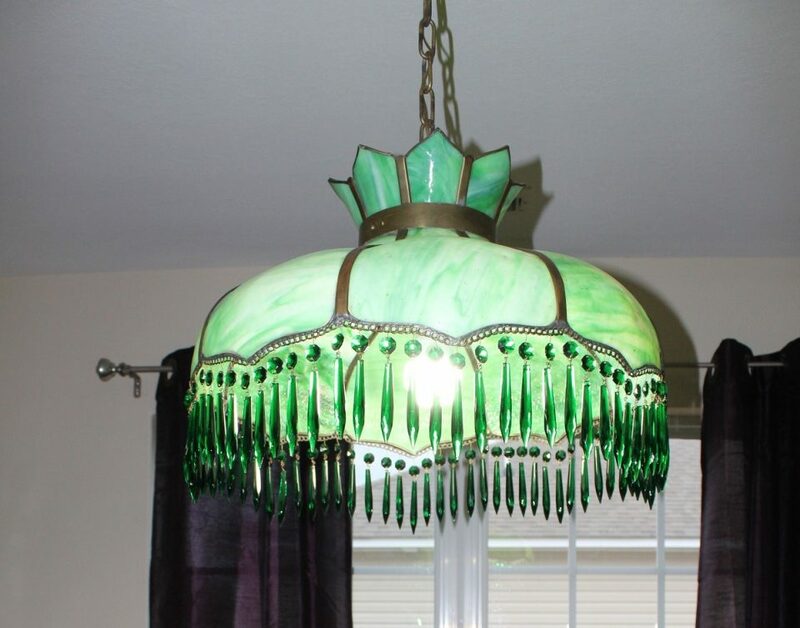 I was raised by an antique dealer. According to my siblings and I, we were raised in a museum. Some of my father’s tactics worked beautifully, others not so much. As someone who was raised to respect everything inanimate, I have obviously brought into my marriage a plethora of antiques and “special” items that my family continues to grow around. Here is how I manage the chaos and collectibles. We have three little boys. Rough, rowdy, loud, wall-climbing little boys. Our belongings take quite a beating from them, but the only things that have been broken have been broken by movers. When each child is around age two, I begin schooling them on gentleness. A simple enough concept in regards to the family pet, but I am also teaching them to be gentle with the glass doors of my antique wardrobe. As the kids get older we begin to expose them to the craftsmanship that goes into making such treasures. At a farmers market one summer we watched a blacksmith craft in traditional fashion. Our oldest son, who was then 4, was fascinated. The blacksmith talked to him about how many hours went into making the items that were for sale. When we got home our son stared at an antique Swedish immigrant chest that I had acquired that year from my father. The trunk is covered in hand hammered ironwork with intricate puzzle locks. After some contemplation he asked “mom, how long do you think it took to make your trunk?” My heart swelled. This was THE learning moment. We came up with a number we thought was reasonable based on how long it took the blacksmith to make his wares. When the conversation was over our 4-year-old had a whole new respect for that trunk. The amount of work that went into making it, the journeys it had made, the skill it took to create it, the cost of something so grand to a family hundreds of years ago. You could see his gears turning. He understood. From that day onward he understood why it was so important not to stand on it, not to throw the lid open, etc. Of course, the conversations did not stop there. I tried to not nag the family constantly, but over time rules were put in place about ball throwing in the house, not touching mommy’s red lamp. Life goes on, but some wonderful things happened as well. Our boys learned to care for things. 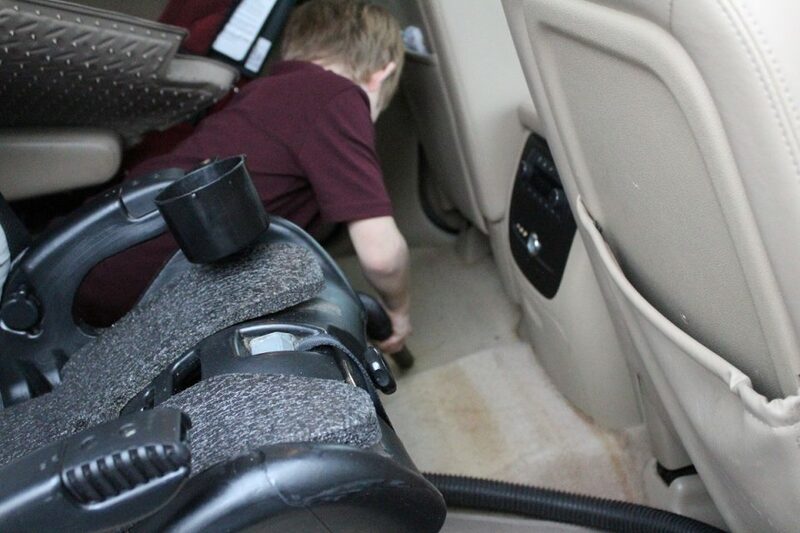 They learned to oil wood, to dust and clean mirrors, and maybe best of all to detail a vehicle. 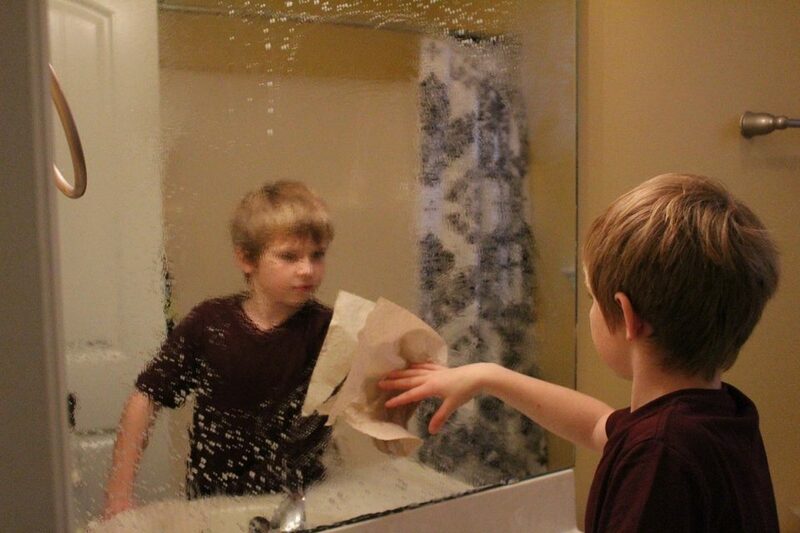 Now at ages 6, 5 and 2 when I say “that is not how we treat our things” the lectures do not have to take place. They know the right way to care for it, they know exactly what they did that was inappropriate, they understand and it’s not because mommy dictates so, but because of a respect for the piece. Of course, this approach to care can be directed at anything that you deem important to you. If your collectible of choice is breakable you might not want the kids to help you care for it and that’s ok! Eventually, you’ll teach them to dust it and maybe you’ll take them to a pottery class, or the manufacturer museum, etc. There are numerous ways to include your children. What we don’t want is for your child to feel like Ferdinand in the china shop. Teach them to care for it and it could live on forever. There is no reason why you shouldn’t have nice things and children! I don’t suggest a new and expensive couch as the things that bear the most physical weight typically fall apart the fastest. If you enjoy beautiful things then you can teach your children too as well. Now that our boys are a bit older my father (woodworking magician) can show them how to repair and refinish the antiques in our lives. Teaching them more about the craftsmanship and difficulty of the work will continue to embed deep respect for the object. If you do not personally know someone who works with these specific mediums do not fret. There are local people everywhere who would love to apprentice a younger generation in the ways of the past. With any luck, we can all raise respectful children that care for family heirlooms for generations to come. Tucked deep in the Blue Ridge Mountains is an architectural masterpiece that is worth your time. 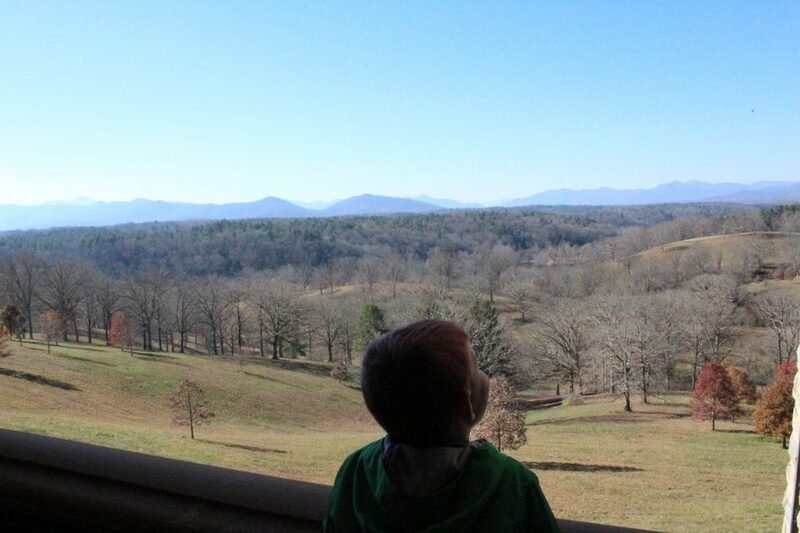 Losing yourself for a full day on the Biltmore Estates is a very easy thing to do, especially if you are toting little people. 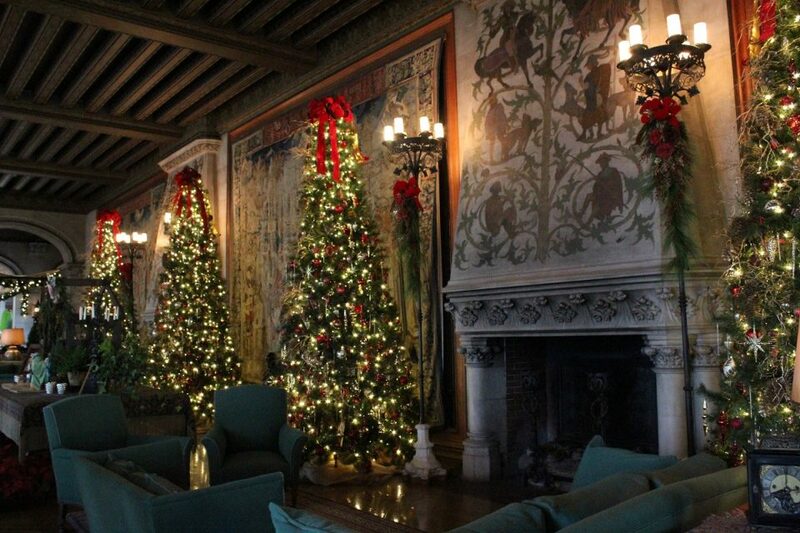 I have now visited the Vanderbilt family’s claim to fame two times in our 2.5 years stationed in North Carolina. Partly, because the house and landscape are so incredible and because it is different every time! With different, exquisite decor for every season and endless exhibit installations, you need to go! “But how do you tour things with small children?” With patience and a plan. You do not need to pre-book anything at all. Upon entering the grounds you will come to what appears to be a visitor center where you purchase all tickets and tours for your visit. This will take a bit of time. There are dozens of tour options. From the main levels only to servant quarter tours and the roof and rafters tours. You cannot go wrong with any of them! You need to allow approximately 2 hours per tour. The tours are not 2 hours long, but you will want some time to compartmentalize all of the new information you are learning, to ask questions and potentially have a bathroom or food break. 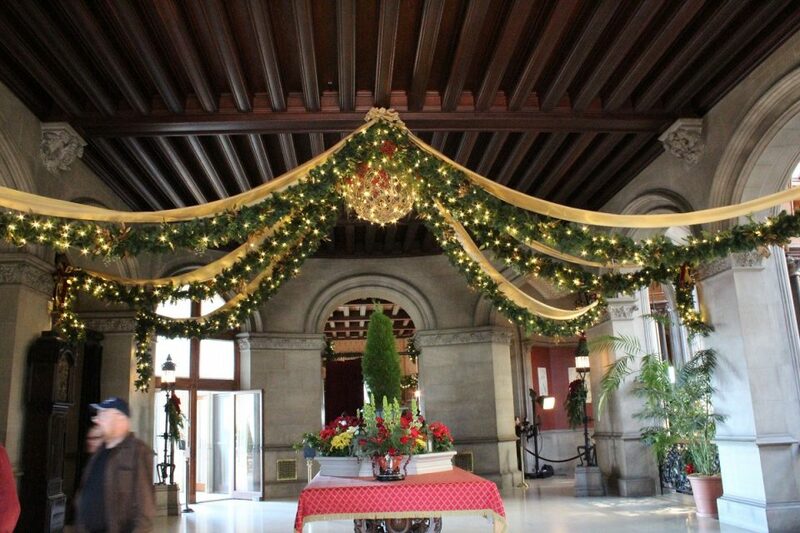 There are a lot of stairs in the Vanderbilt Mansion. There is elevator access, which can reach most of the levels. Your experience will be richer by taking the stairs. The staircase itself is a marvel and the information delivered by tour guides while climbing is worth hearing. If stroller trumps baby-carrier then that is perfectly fine and you can still do a few of the tours this way. 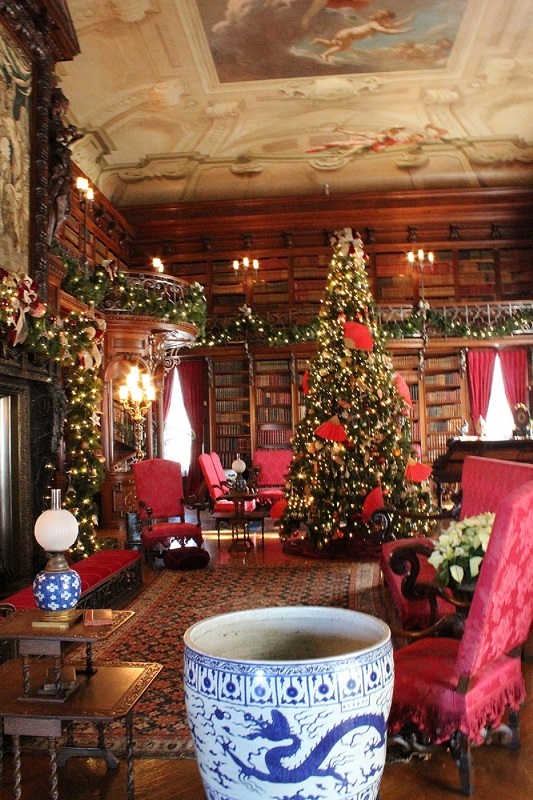 Although, the tour guides will answer every single question you have with class and tact; I highly recommend watching a Biltmore Estates documentary or reading a book before going. The tour guides treat guests as if they have basic knowledge of the family history as to not insult anyone. Names and dates can get very confusing very quickly. The majority of the tour options are quite kid-friendly. Obviously, some tour guides have that kid-friendly spark more than others, but all will gladly answer the children’s questions. I found that my children enjoyed the Roof and Rafter tour the best because you get to see the call bells of the servants, the original electrical guts and the exterior roof walks. My science-loving kids thought that this stuff was pretty cool. It is also a more specialized tour. Therefore, the tour was smaller than the main level handheld tour that EVERYONE does. If you are on the fence about spending money on an extra tour that your children may or may not enjoy-then don’t! You can do a general tour, which includes the basement, kitchen, and two main level floors. This tour alone will take every bit of 2+ hours and is handheld audio guided. The kids can have an audio guide as well, which I have always found helps them feel included in the experience. 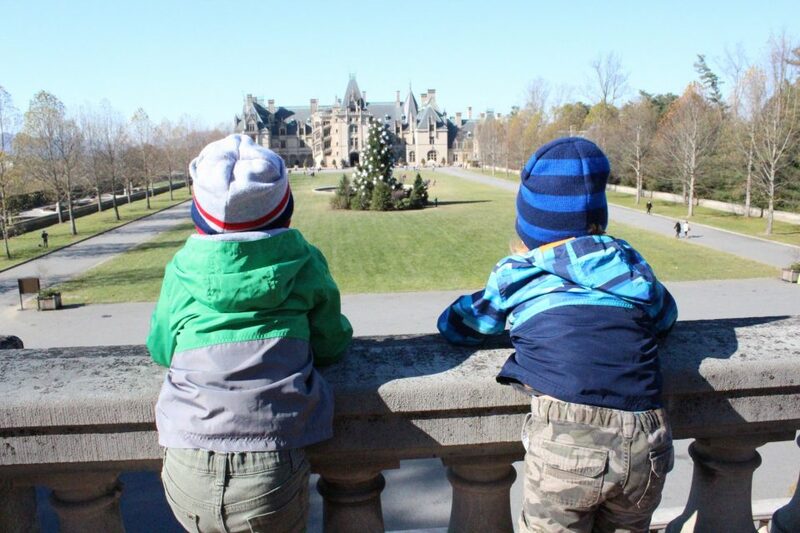 If you do not want to go into the house at all with the kids then you can spend your day exploring the grounds and gardens of the Biltmore Estates! There are endless trails, gardens, greenhouses, fountains and when you are finally hungry there are the stables! Yes, that’s what I said, the Stables! The original horse stables have been converted into a beautiful shopping area and restaurant to include an ice cream parlor, toy store, and Christmas shop! Yes, these were well-treated horses. It really is THAT big. Whether you are planning on spending the day or a week you are going to have a wonderful time exploring. The Estates are approximately 20 square miles. From the roof of the mansion, the Vanderbilt family owns everything the eye can see. Also on the grounds are a hunting reserve, numerous restaurants, two hotels, a golf course, private fishing tours, and the list continues. If you want to spend a week on the Estates you can do so without ever needing to leave the grounds. If you want to spend thousands of dollars or simply less than a hundred, both are entirely achievable. Regardless of how you vacation you are certain to have a wonderful experience. You and your children will consider it time well spent. Get out there.